The eighth episode of season five focused on happenings at Meereen, Braavos, King’s Landing, Winterfell, Castle Black and Hardhome. Hardhome was written by showrunners David Benioff & D. B. Weiss with Miguel Sapochnik in the director’s chair for the second time this season. 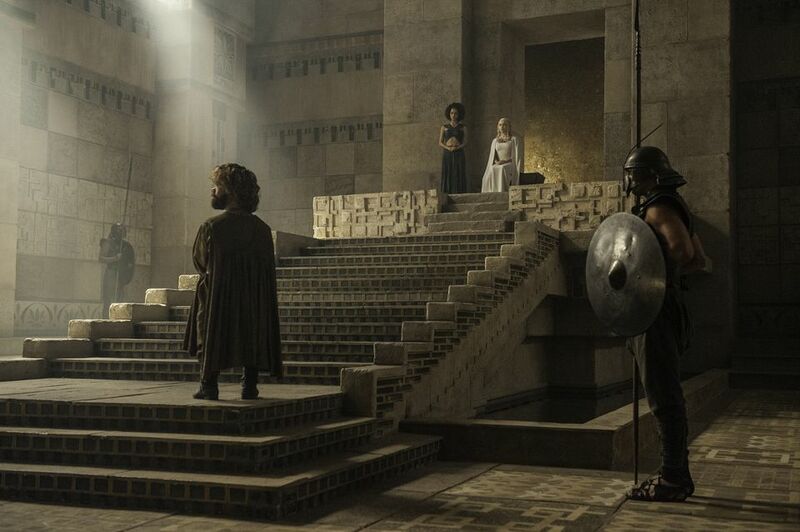 The episode began in Dany’s (Emilia Clarke) throne room where she decided the fate of Jorah (Iain Glenn) and Tyrion Lannister (Peter Dinklage). Jorah tried to talk to her but was swiftly told to shut up. Dany was more interested in what Tyrion had to say and why she should keep him around. As usual Tyrion’s quick thinking and wit kept him out of trouble. He claimed to be the greatest Lannister killer of all time and told a story of her when she was a child. He expressed his desire to advise her and after listening to what he had to say she asked for Jorah to be removed from the city. He lingered outside her throne room long enough to take a peek at his secret greyscale infection. Jorah decided to head back to the slave master who bought him previously and offered to fight in front of Dany for him due to winning his previous match in the fighting pits. Jorah isn’t ready to give up on impressing Dany just yet it would seem. 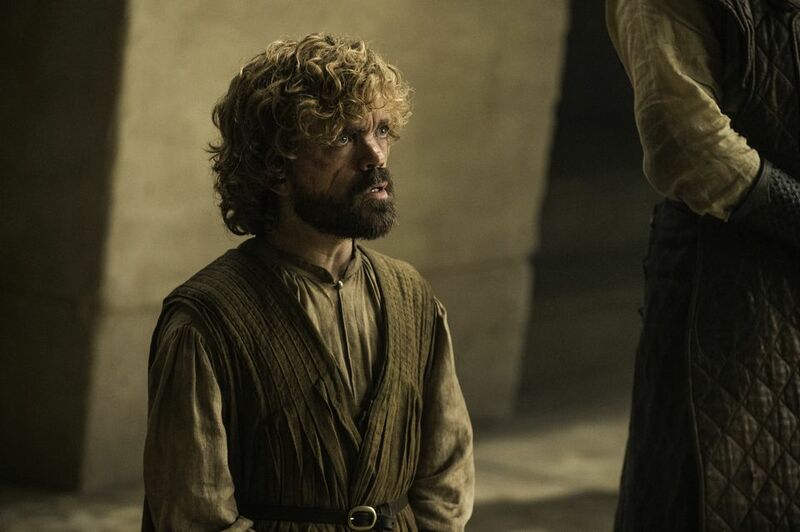 Seeing Dany and Tyrion together is terrific and we think they will make a formidable pairing. 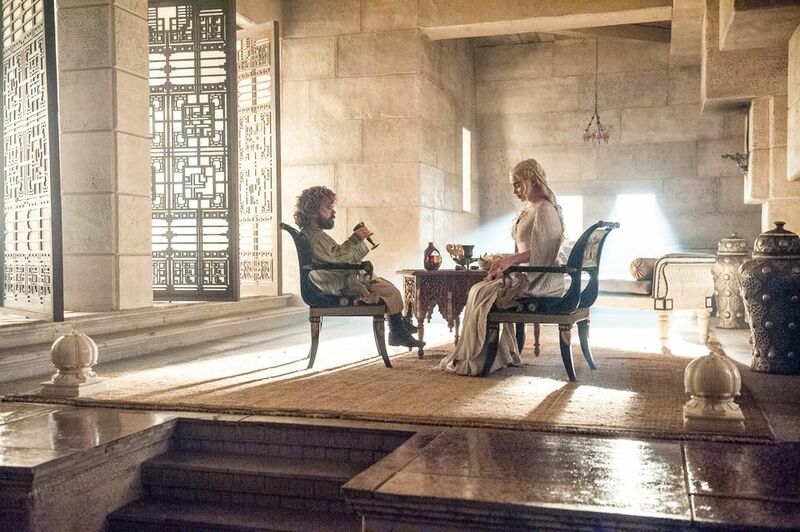 Later they share some wine while Dany decides what to do with him. It’s a wonderful scene and they bounce off each other well. In King’s Landing we discover that Cersei (Lena Headey) is now getting a taste of her own medicine. 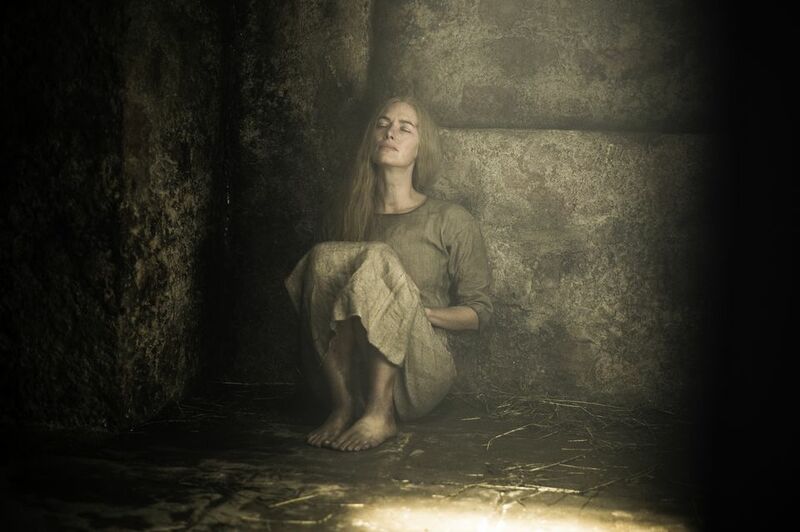 Like Margaery she is now sat chained in her cell, dressed in rags and surviving on tiny amounts of food and water. Knowing how evil she can be there’s some pleasure in seeing her suffer for a change. To stand a chance of being released she needs to confess to the High Sparrow (Jonathan Pryce) but is refusing to do so. 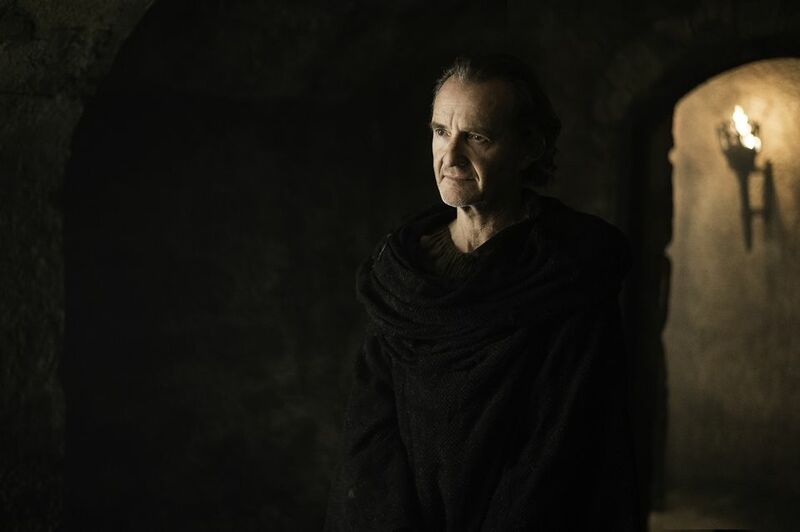 She is visited by Qyburn (Anton Lesser) who attempts to get her to give in and confess. She continues to refuse even when she hears how badly Tommen (Dean-Charles Chapman) is doing without her and Margaery. In Braavos we saw Arya (Maisie Williams) training with Jaqen H’ghar (Tom Wlaschiha) once more. She seems to be making great progress but we hope she gets more to do before the end of the season. At Winterfell Reek (Alfie Allen) is dropping off some more food and drink for Sansa (Sophie Turner). She’s becoming a lot more confident and confronts him about telling Ramsay (Iwan Rheon) her plan with the candle. 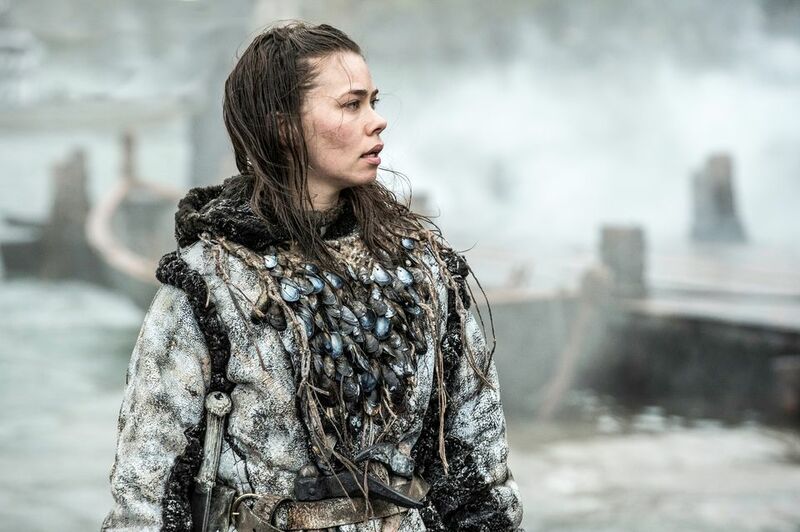 He tells her there is no escape and talks of his torture at the hands of Ramsay. Instead of leaving it Sansa pushes him by saying she would do the same to him as Ramsay if she could. Theon says he deserves to be Reek for the terrible things he has done. 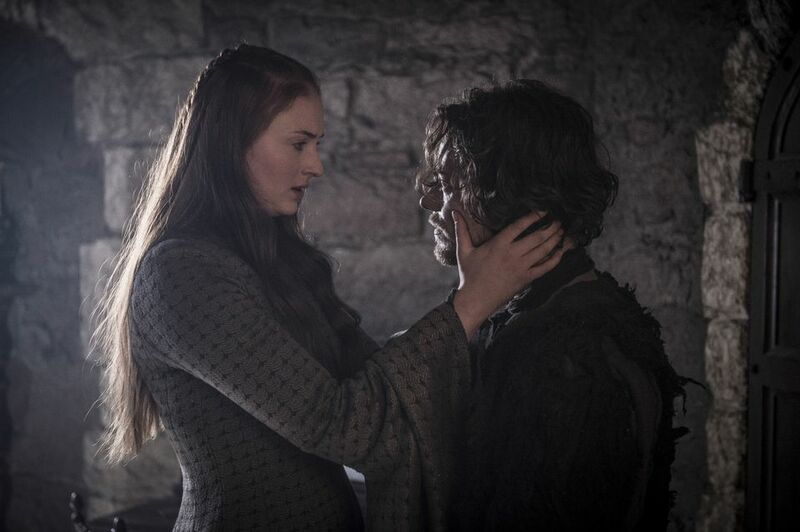 Sansa pushes him further and talks of her brothers Bran and Rickon who she believes he killed. By accident Theon lets something slip before finally revealing that her brothers escaped and he killed two farm boys in their place. This gives Sansa hope and we wonder if Ramsay should be more scared of her? Meanwhile the Boltons are holding a war council on how to deal with Stannis. Roose thinks they are at the advantage and wants to try and hold on while his enemy struggles and starves in the harsh winter weather. His son Ramsay has different more violent intentions and wants to strike them first and hard. He reckons he can do so without an entire army and request 20 good men. We’ve seen Ramsay do this sort of thing before and wonder if he intends to target Stannis. At Castle Black Gilly (Hannah Murray) tends to Sam’s (John Bradley-West) wounds which he received defending her last episode. The young boy Olly (Brenock O’Connor) brings them some food and drink. He asks Sam about why Jon Snow (Kit Harington) has gone North with Tormund (Kristofer Hivju) and Sam does his best to explain the reasons to him. 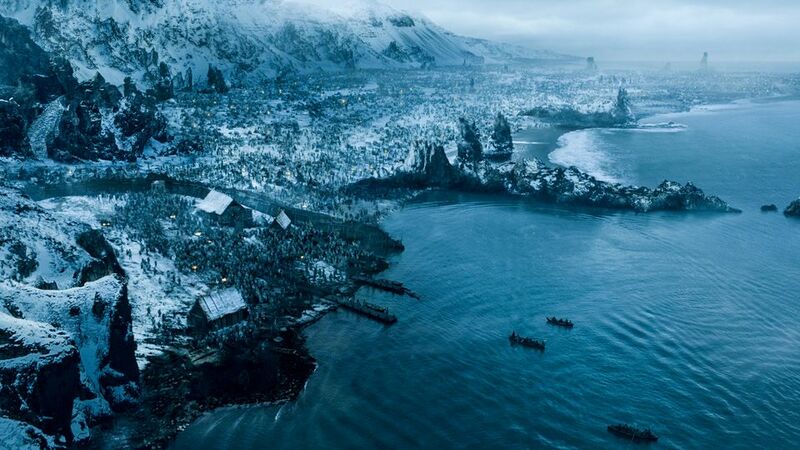 The scene cuts to Hardhome where Jon Snow and Tormund are arriving by boat. The Wildlings are awaiting them and keen to know what’s going on. 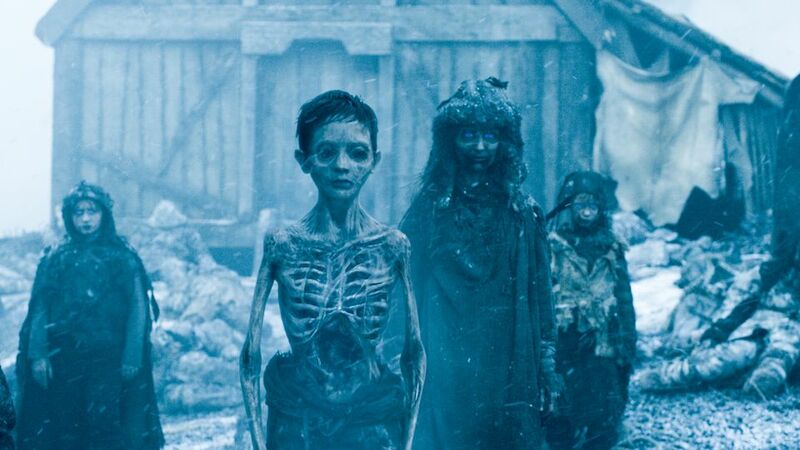 The are met by the Lord of Bones who isn’t happy about the situation. When Tormund explains they want to talk the Lord of Bones accuses him of being a traitor. 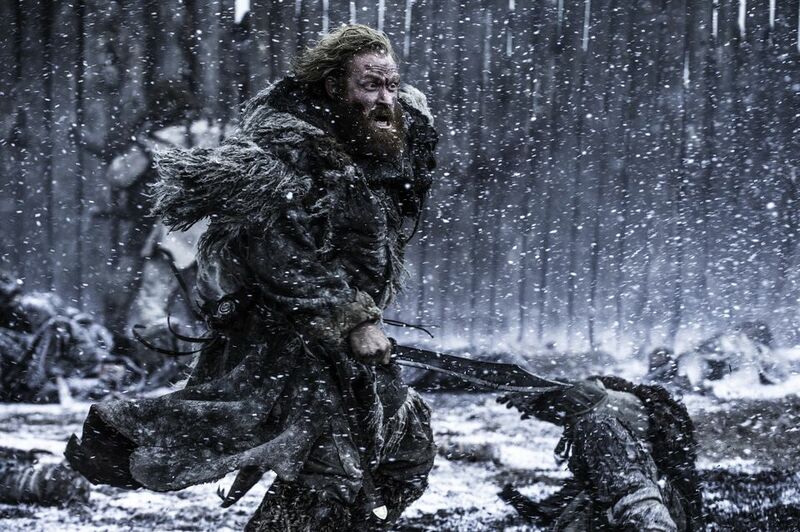 Tormund deals with him the way he knows how and smashes him to death with his own staff. 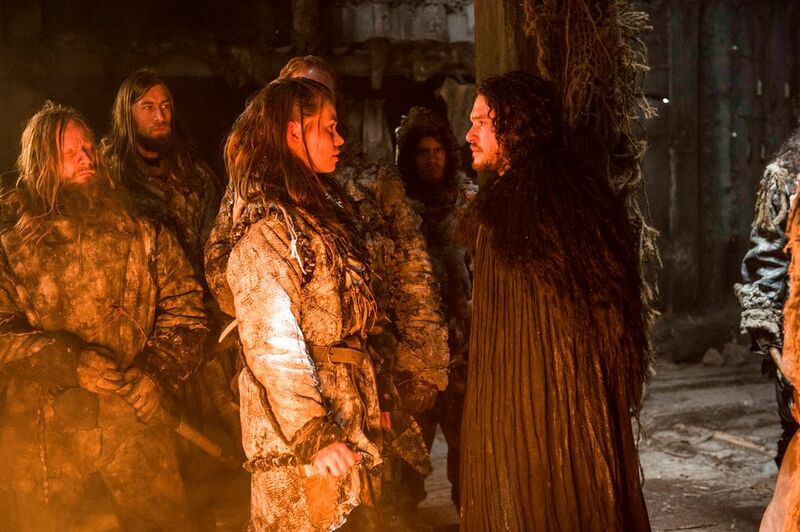 They then go and meet with the elders where Jon puts forward his suggestion to let them all live south of the Wall. To try and sweeten the deal he promises them weapons of dragonglass to keep them safe against the Whitewalkers. With Tormunds help some of the elders are convinced it is the right thing to do and agree but the Thenns do not. Game of Thrones. Series 5. Episode 8. Hardhome. As those who agreed to leave begin getting on boats there is a loud noise and it looks like there will be an avalanche. 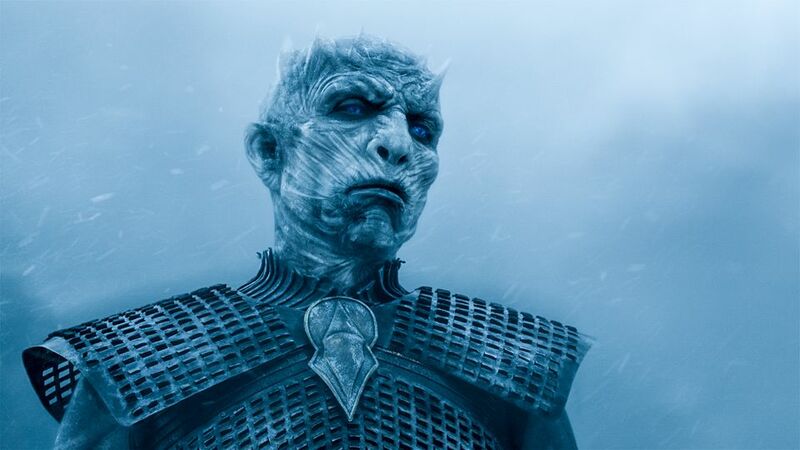 It turns out to be far worse as it’s actually an attack from a massive army of White Walkers and Wights led by the Night’s King. 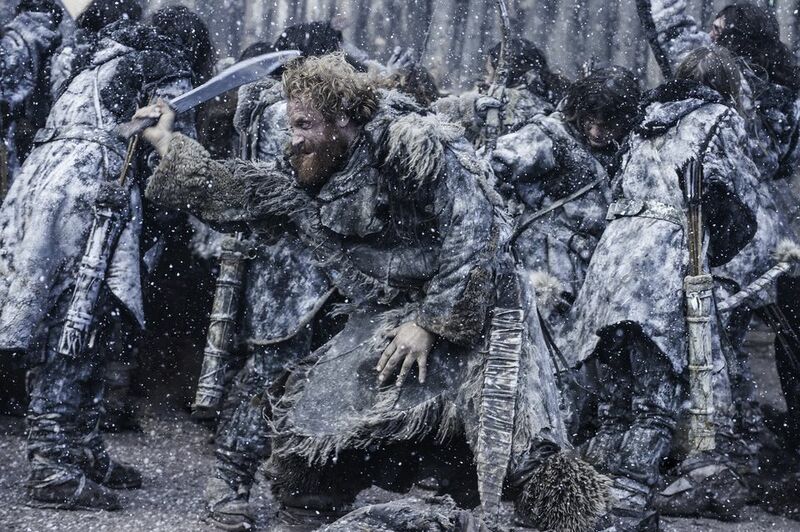 They start to make short work of the Wildlings and their defenses despite the Thenn’s choosing to close their gate. 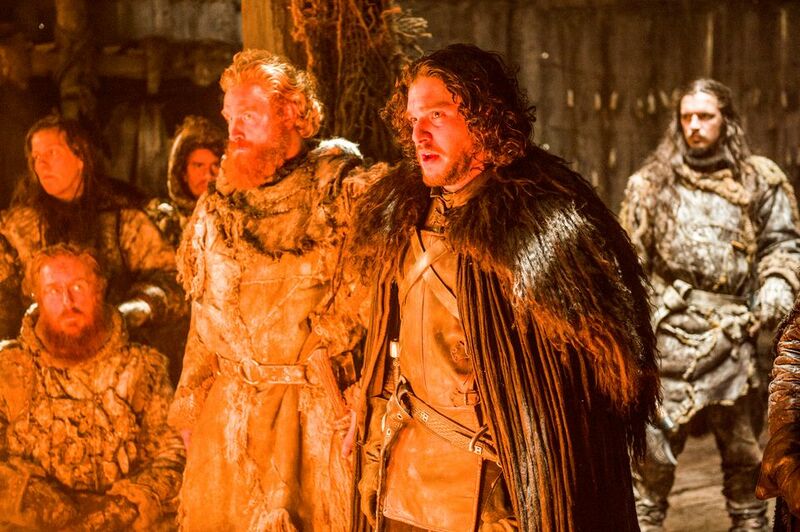 After realising there isn’t time to queue for the boats, Jon Snow rallies his few Night’s Watch brothers to try and hold them back. 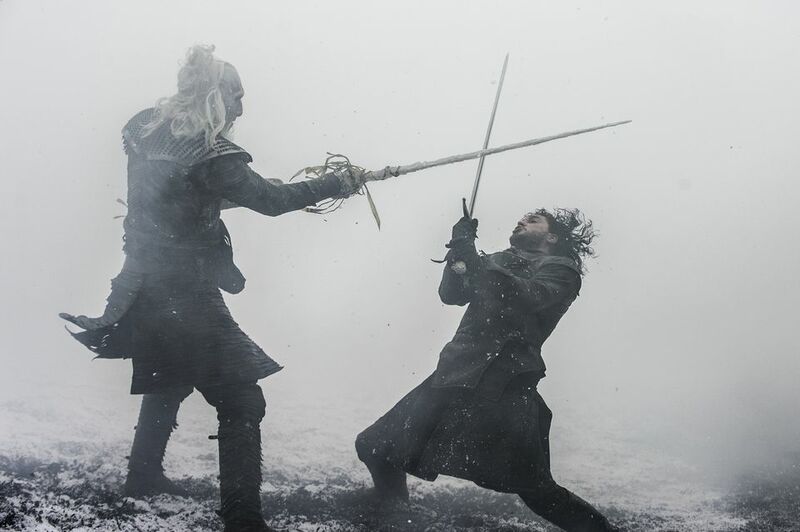 As they fight their way back Jon decides it’s probably a good idea to get the dragonglass back. As Tormund kills almost everything that moves Jon enters the burning building where they left the dragonglass. 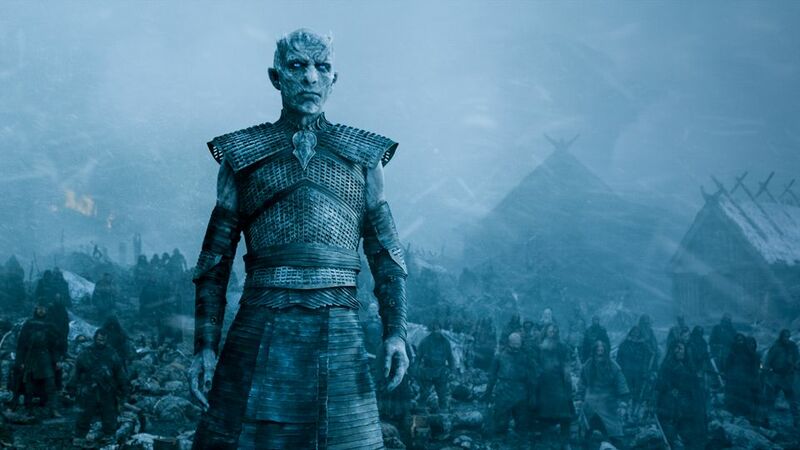 He meets up with the Thenn who opposed him but they both soon realise they have bigger problems as a White Walker attacks. He makes short work of the Thenn and then turns his violence on Jon Snow. We already know that Jon can handle himself in combat but it looks like he’s met his match and we worry that this might be his end. Jon manages to dodge a few blows but fails to land any himself either before being smashed about the place. 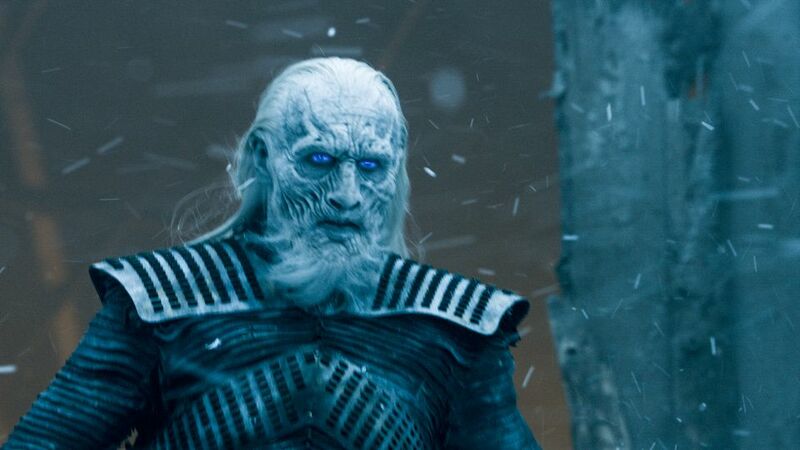 As Jon escapes outside he is pursued and the White Walkers takes aim and swings his weapon. 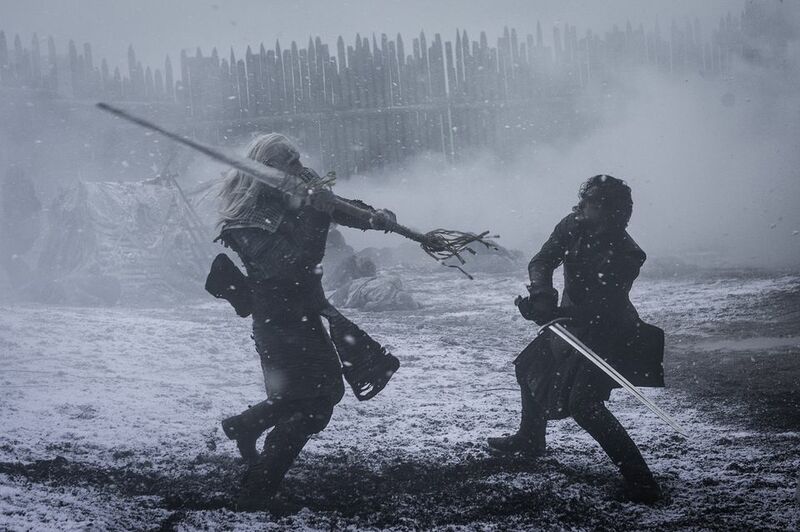 Jon manages to block with Longclaw, his Valyrian Steel sword, to both their surprise it holds. It’s then Jon’s turn to attack and the sword shatters the White Walker. 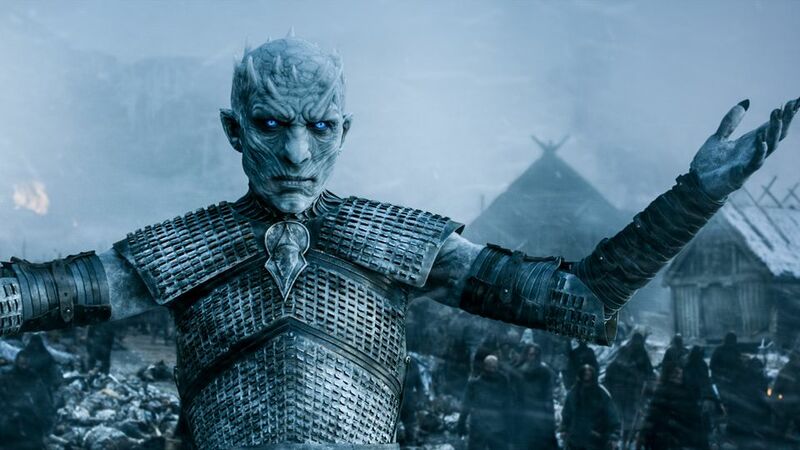 As Jon and Tormund flee by boat the Night’s King stands on the dock. He stares menacingly at Jon before raising his arms up. 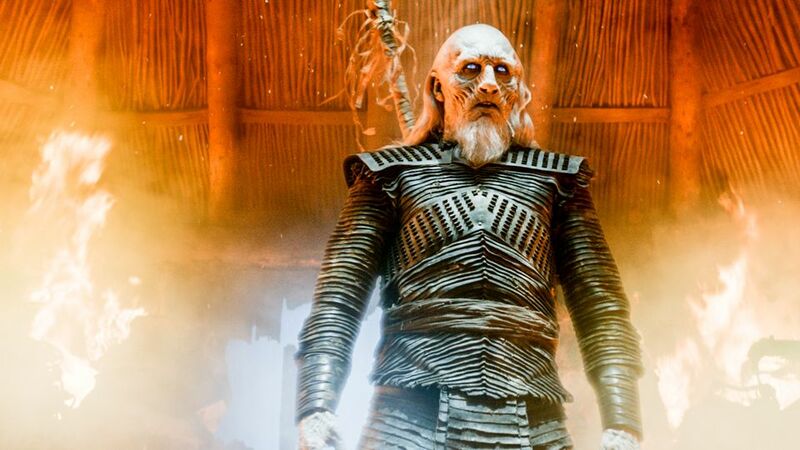 Suddenly those slain in battle awaken and rise again as they join the ranks of his Wight army. It’s a terrifying scene and surely just a taste of what is to come. 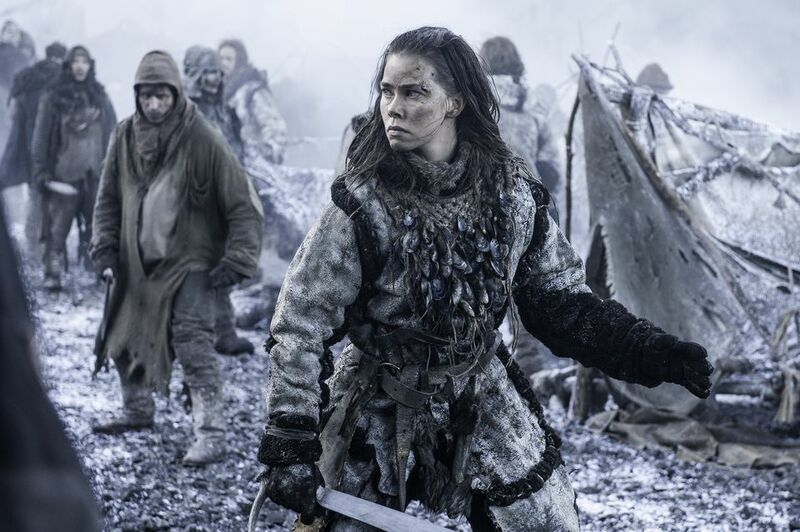 This was easily the best episode of Season 5 so far and the battle between hundreds of Wights, Wildlings, Crows, Giants and White Walkers was incredible. 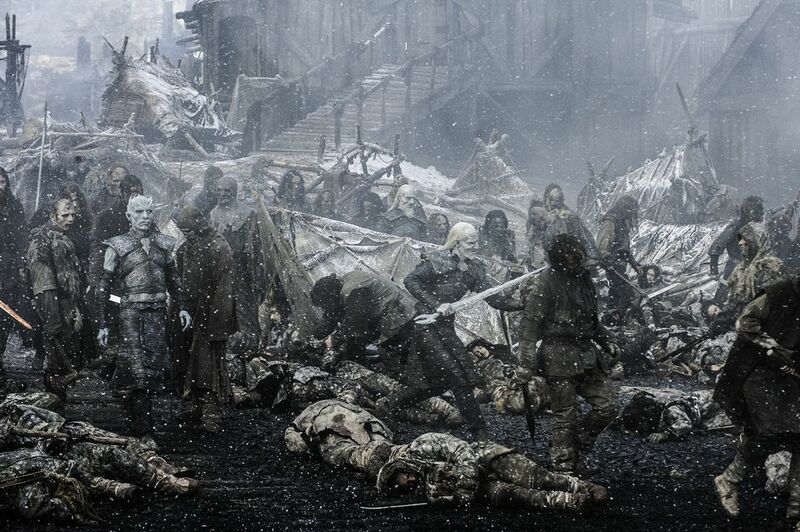 Let us know your thoughts on Hardhome in the comments below as well as your hopes for the rest of the season.